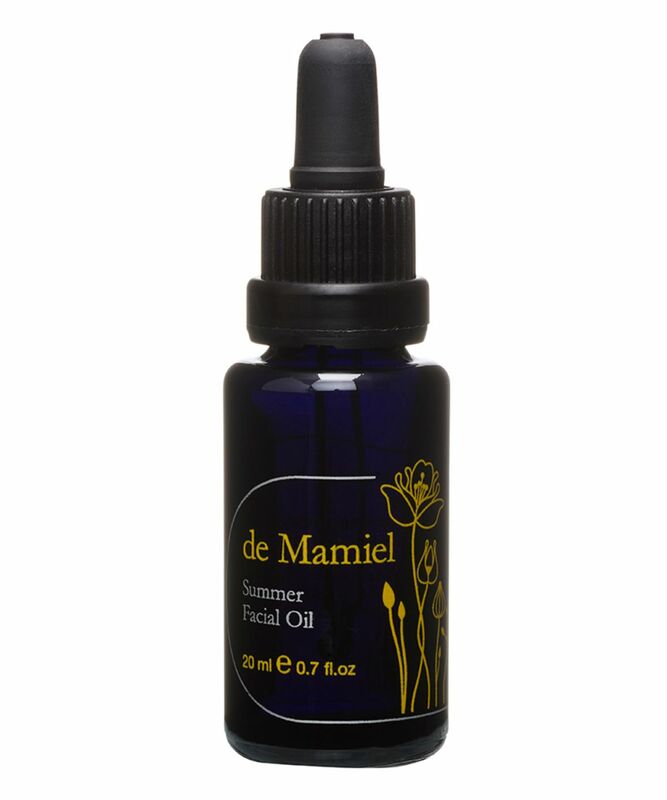 de Mamiel limited edition facial oils are designed to help support the needs of both the skin and the emotions at specific times of the year. We need to be kind to our skin in the summer as it has come from a place of dryness, and must equip itself to cope with the irritation, cell damage and sensitivity caused by sun exposure. Annee de Mamiel is a leading authority on acupuncture and her range of oils have been formulated for efficacy and refined over years in her treatment room - exquisitely sensorial and incredibly potent - they heal, de-stress and uplift. While the sun is a short term miracle worker for skin that's prone to the odd blemish, the hot summer months can also play havoc with its delicate sensibilities. Too much sun (tsk! ), the dreaded drying effects of air-conditioning and heat/perspiration can all upset skin's balance. de Mamiel's Summer Facial Oil contains vital essential oils to help support the health and appearance of your skin through this season; de-congesting, cooling, soothing, toning and smelling so good that it restores an overall sense of wellbeing. Smooth 4-5 drops onto your cleansed face and neck. Pause for a moment, cup your hands and cover your nose and mouth, breathe deeply for the count of 3, then slowly out for a count of 5, helping to release tension. Now massage into the skin in small, circular movements from the centre out, until absorbed. Oenothera Biennis (Evening Primrose) Oil*, Rosa Canina (Rosehip) Seed Oil**,Actinidia Chinensis (Kiwi Seed Oil)**, Limnanthes Alba (Meadowfoam) Seed Oil* Adansonia Digitata (Baobab) Seed Oil**, Calendula Officinalis Helianthus Annuus (Calendula) Oil*,Opuntia Ficus Indica (Prickly Pear) Oil*, Punica Granatum (Pomegranate) Seed Oil*, Pogostemon Cablin (Patchouli) Oil*, Pelargonium Graveolens Roseum (Geranium) Oil*, Avena Sativa,Rosmarinus Officinalis (Arctic Oat) Extract*, Rosemarinus Officinalis (Rosemary)*, Hippophae Rhamnoides (Seabuckthorn Pulp Co2 Extract), Rosemarinus Officinalis (Rosemary Antioxidant), Thymus Vulgaris Ct Linalol (Thyme) Oil*, Jasminium Sambac (Jasmine Sambac) Oil¸ Litsea Cubeba (May Chang) Oil*, Mentha X Piperita (Peppermint)*, Citrus Limon (Lemon) Oil* Naturally Occurring - Patchoulol; Bulnesene; Guniene; Citronellol; Geraniol; Linalool; 1,8 Cineol; Pinene; Camphor; Myrcene; Citral; Limonene; Citronellal; Menthol; Menthone; Menthyl Acetate Flower Essences Of Chamomile, Hawthorn Berries, Linden Blossom, Scot's Primrose, Sunflower, Stargazer Lilly, California Wild Rose, Handel Rose.